Her green eyes shone bright with pride when Nancy Saunders of Kuujjuaq, northern Quebec was throat singing with her friends and an elder in front of 50 guests at the Montreal Museum of Fine Arts. 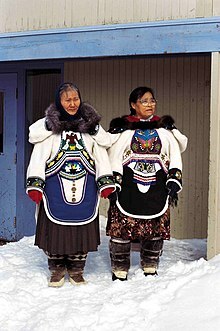 Throat singing in a traditional way of making playful guttural sound, practised by Inuit women. Nancy Saunders was honouring the knowledge of her elders, passed down for thousands of years from woman to woman. 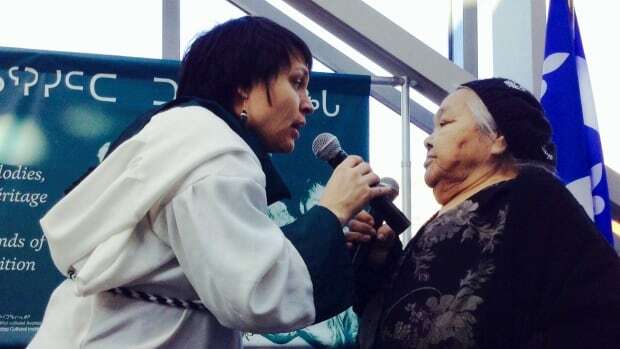 Yesterday, Quebec recognized its first example of intangible cultural heritage: throat singing,katajjaniq. 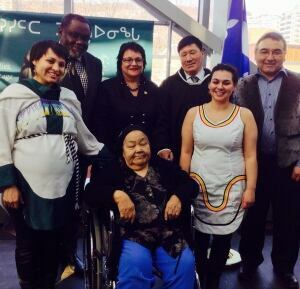 Quebec’s Culture and Communications minister, Maka Kotto explained why throat singing was chosen as the first designation after the creation of the Loi sur le patrimoine culturel (Cultural Heritage Law). Avataq Cultural Institute president Charlie Angark and Makivik Corporation president, Jobie Tukkiapik accepted the honour on behalf of all the Inuit of Nunavik. Quebec will designate many other examples of intangible cultural heritage in the coming months, but yesterday the spotlight shone on the Inuit gathered at the Montreal Museum of Fine Arts. Nancy Saunders and Taqralik Partridge share a knowledge that has been passed down by women from time immemorial. When asked if she gets tired of talking about her culture and Inuit identity, Nancy Saunders laughs. “My culture is the best!” she adds, her eyes shining like little icicles in the January sun. Inuit throat singing or katajjaq is a form of musical performance uniquely found among the Inuit. (There used to be a similar style,Rekuhkara, practiced by the Ainu in Hokkaidō, but that has since died out.) Unlike the throat singers in other regions of the world, particularly Tibet, Mongolia and Tuva, the Inuit performers are usually women who sing only duets in a kind of entertaining contest to see who can outlast the other. However, at least one notable performer, Tanya Tagaq, performs throat singing as a solo artist and as a collaborator with non-throat singing musicians such as Björk. The musical duo Tudjaat performed a mixture of traditional throat singing and pop music. Originally, katajjaq was a form of entertainment among Inuit women while men were away on hunting trips, and it was a regarded more as a type of vocal or breathing game in the Inuit culture rather than a form of music. Two women face each other usually in a standing position and holding each other’s arms. Sometimes they will do some kind of dance movements while singing (e.g., balancing from right to left). One singer leads by setting a short rhythmic pattern, which she repeats leaving brief silent intervals between each repetition. The other singer fills in the gap with another rhythmic pattern. The sounds used include voiced sounds as well as unvoiced ones, both through inhalation or exhalation. The first to run out of breath or be unable to maintain the pace of the other singer will start to laugh or simply stop and will thus lose the game. It generally lasts between one and three minutes. The winner is the singer who beats the largest number of people. At one time, the lips of the two women almost touched, so that one singer used the mouth cavity of the other as a resonator, but this is less common in present day. Often, the singing is accompanied by a shuffling in rhythm from one foot to the other. The sounds may be actual words or nonsense syllables or created during exhalation. John Metcalf‘s 1990 opera Tornrak features throat singing by the Inuit characters. A scene of Inuit throat singing appears in the 1974 Timothy Bottoms film The White Dawn. The 2003 film The Snow Walker contains a scene of Inuit throat singing. The 2001 film Atanarjuat (The Fast Runner) has a scene with Inuit throat singing. The 2007 film, Wristcutters: A Love Story, features a “mute” character named Nanuk who practices this style of throat singing. A rather imaginative variation on throat singing is featured in the 2007 Dan Simmons novel, The Terror. In a scene of the The Simpsons Movie (2007), Homer Simpson is shown throat singing with an Inuit woman in order to have an epiphany. Rick Mercer, in an episode of his self-hosted show Rick Mercer Report, attempted to throat sing with an Inuit woman when he visited the 2008 Arctic Winter Games inYellowknife. An August 2008 an AT&T radio commercial references kadajjat/throat singing in reference to the speaker’s roommate. In 2005, Tafelmusik Baroque Orchestra recorded The Four Seasons Mosaic CD and DVD documentary. A reinvention of Vivaldi’s Four Seasons by Mychael Danna featuring Tafelmusik Baroque Orchestra; Jeanne Lamon, violin; Aruna Narayan, sarangi; Wen Zhao, pipa and throat singers Aqsarniit (Sylvia Cloutier and June Shappa). The electropop band Row of Cookies incorporated a sample of Inuit throat singing in their version of the song New Girl Now by Honeymoon Suite. The British ITV documentary Billy Connolly: Journey to the Edge of the World features Billy Connolly in the Canadian Arctic. In the second episode, he visits a pair of women demonstrating the finer points of throat singing. The 2012 CBC TV drama series Arctic Air features a theme song written by Tim McCauley and performed by Tanya Tagaq incorporating elements of traditional Inuit throat singing over a modern dance beat. A task in the seventh leg of the first season of The Amazing Race Canada required teams to listen to a traditional Inuit throat singing performance. In 2014, Nunavik throat singing (katajjaniq) has become the first cultural item to be given the intangible cultural heritage designation by the government of Quebec. inuk throat singing alone! the songs are #1 love song. 2. segal 3. Nunavut 4. Saw 5. qimmaaluapik 6. Geese thats it! This video is was produced by the Ottawa Inuit Children’s Centre for the Inuit Cultural Online Resource. The purpose of this video is to help teach and offer a sampling of Inuit throat singing. Kathy and Janet’s application for the 2008 Arctic Winter Games.